DermSpectra Total Body Digital Skin Imaging System enables physicians to detect, track, and monitor critical skin changes (skin cancers, eczema, moles, psoriasis, and rashes) to ensure the best healthcare outcomes for patients. The DermSpectra Total Body Digital Skin Imaging System consists of three major components: an imaging station, a secure HIPAA server/database, and an easy to use iPad image viewing application for physicians and patients. The DermSpectra Total Body Digital Skin Imaging System is comprised of nine cameras in seven standardized poses utilizing the same lighting and distance configurations; ensuring exact quality duplication of photos year over year. This reliability in digital skin imaging technology provides physicians the baseline required to make trustworthy observations in skin changes over time. 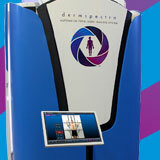 The DermSpectra Total Body Digital Skin Imaging System generates quality digital skin images instantly and securely to the physician’s computer and or tablet, for immediate access, viewing, and tagging. Digital images can be marked using simple touch screen features that allow the physician to zoom in on lesions, add notes, circle abnormalities or changes, and annotate directly on images. DermSpectra Total Body Digital Skin Imaging System equips physicians and medical researchers with a state-of-the-art, powerful skin and body imaging tool that aids in the detection of skin cancers. Dedicated to the advancement of innovative medical technologies in early skin disease detection, DermSpectra Total Body Digital Skin Imaging System is rapidly gaining adoption by the medical community, government, and general public. DermSpectra offers dermatologists, primary care physicians, telemedicine centers, vein specialists, and cosmetic and plastic surgeons an advanced medical imaging system that easily fits into the standard medical office, with an easy-to-use interface that can be managed by nurse technicians, physicians or medical staff. According to Dr. Richard Carmona, 17th U.S. Surgeon General and DermSpectra board member, “Capturing digital skin images and tracking them year-over-year will aid in the early detection and management of skin diseases and cancers such as melanoma. 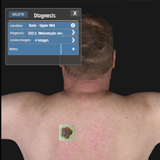 DermSpectra is focused on early skin cancer detection with the goal that every person should have a total body digital skin image in their medical record." "DermSpectra is setting the industry standard for how future dermatology, primary care, and medical practices will capture image data to assist early detection of melanoma and other skin diseases. With skin cancer incidence and treatment costs on the rise, DermSpectra is filling an imaging gap to aid in preventative skin screening."